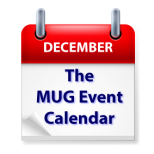 The MUG Event Calendar comes back to life after the U.S. holiday weekend. Christine Porter of Telestream will show off ScreenFlow to a Illinois group, a Connecticut group will discuss 3D printing, and groups in Colorado, California and elsewhere will show off Yosemite to their members. Oh, and did we mention holiday parties in Australia, Ohio and more?